It's pretty hard to explain truly what a launch experience is like. We are 3 miles away from the launch pad. That means we see the exhaust before we hear anything. We see the flame before we hear anything. Then you see the flame is brighter than the sun, a more intense orange. A massive jet of flame behind the rocket. Then you hear the sound of the main engine. It's a big rumble. Kind of like an earthquake crossed with a jet airliner flying overhead. It's loud. 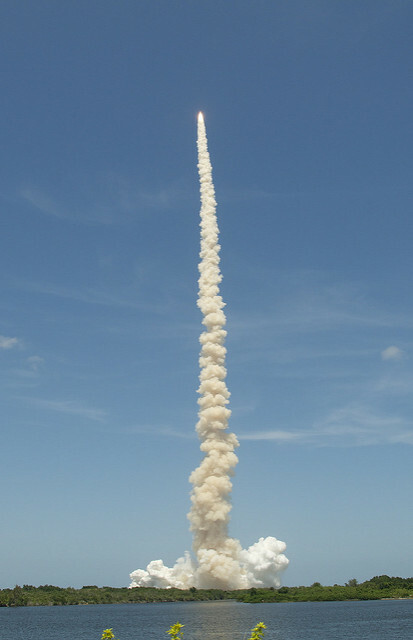 But then the solid rocket boosters kick in. And suddenly it sounds like you're inside a giant drum that 100 monkeys are banging on. Astronauts in the Shuttle. Close out crew finished. 4:04 PM Eastern, 1:04 PM Pacific. We'll be upoading a bunch of images after the launch. 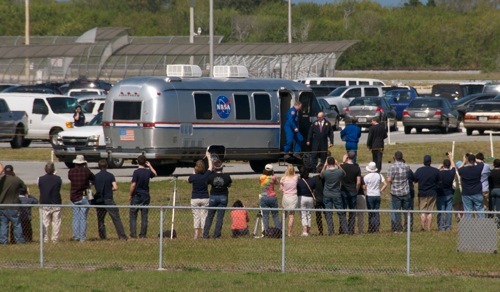 The Crew Transport Vehicle, aka The Astrovan, transports astronauts from the checkout building to the launch pad. 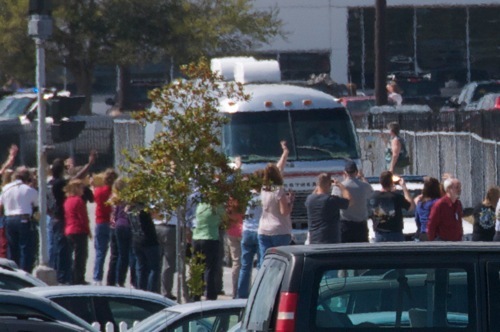 The Astrovan drives by the Vehicle Assembly Building and Launch Control complex, stops for a few pictures and drops off some VIPs before it proceeds to launch pad 39A. The non-human passenger of STS133: Robonaut R2. A humanoid robot that is being tested in space, to see how well it will work in a no-gravity environment. 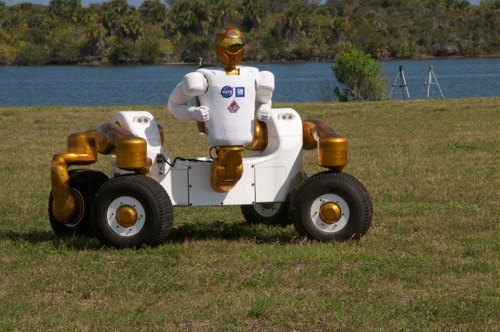 NASA was showing off another Robonaut attached to a rover-style vehicle, which could be used for virtual-reality style off-planet exploration. Robonaut R2 is the first US-built robot on the International Space Station. It was a very interesting demonstration, showing off the safety features and how it could shake your hand and not crush you, and how it responds to its tasks being interrupted. The "head" is actually the visual system for the robot, so it serves a functional purpose. 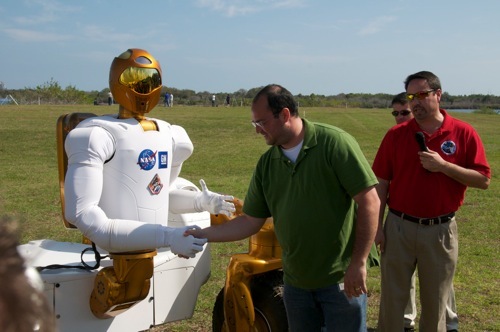 We will likely be seeing more interations of Robonaut in the future. 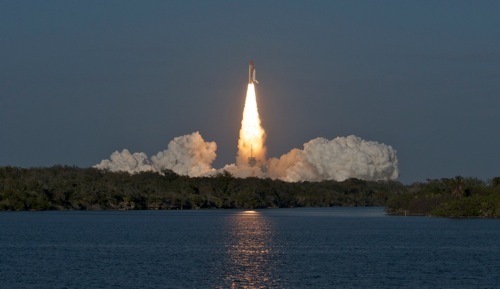 Launch day bring lots of excitement to the Kennedy Space Center. The crowds are filing into the public viewing areas. 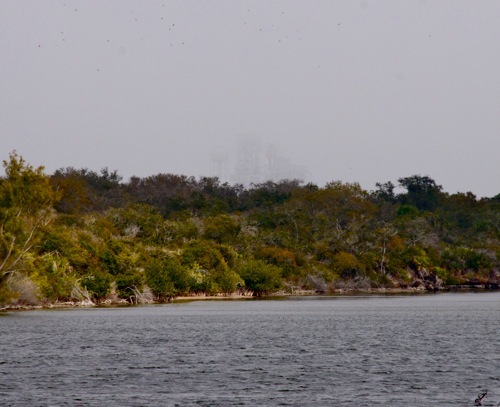 One popular place with a good view is the Astronaut Hall of Fame, across the river from KSC. 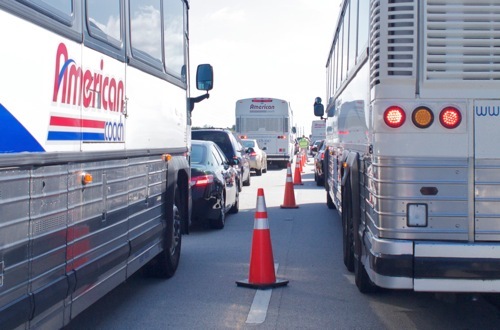 Traffic started backing up on the West side of the Causeway as KSC security makes sure that only people with permits and car passes try to cross the bridge to KSC. There are tons of busses taking visitors to the public viewing areas. 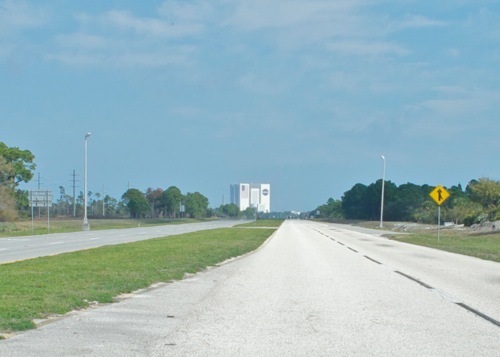 The roads empty out once we're past the KSC Visitor Center. 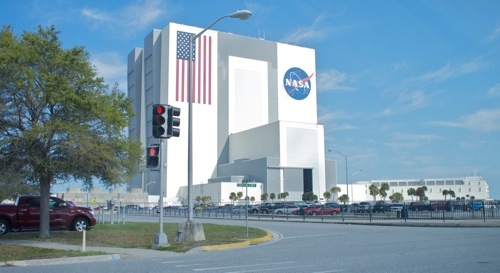 The facility is huge, we're now about 2 miles from the VAB and launch control center. The huge size of the VAB makes it seem much closer than it is, your eyes make you think it's only a half mile away at most, but you keep driving and it only slowly gets bigger. 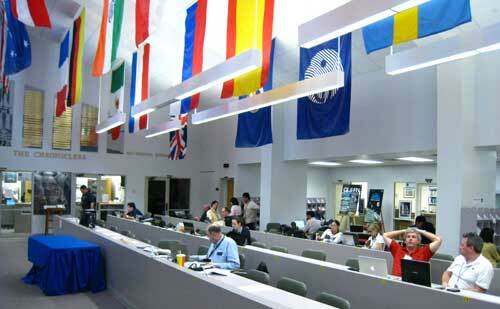 Finally we arrive at the media center. It is a beautiful hot day here at Kennedy Space Center. The Vehicle Assembly Building is glowing in the sun, compared to yesterday when it was shrouded in fog. 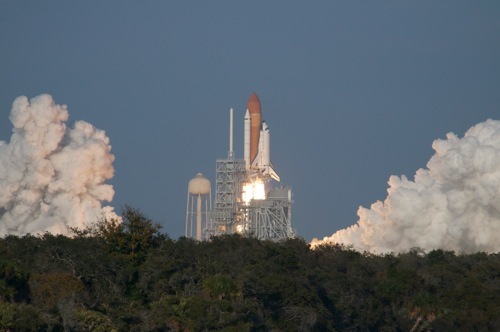 At 7:20AM Eastern this morning, the go has been given for tanking of shuttle Discovery. 500,000 gallons of rocket fuel are now being loaded into Discovery. Weather now is 90% go and fueling began at 7:25a. The weather is clearing up and from Launch Pad 39A, looking up we could actually see stars. There was still some whisps of fog surrounding Discovery as the Rotating Support Structure was moved away to give us a full view of the shuttle. But if you looked straight up, you could see lots of stars! Hopefully there will be no weather delay tomorrow. We're all excited for the launch! 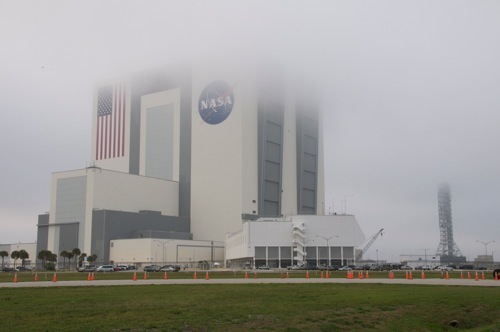 It's a windy, foggy grey day at Kennedy Space Center. 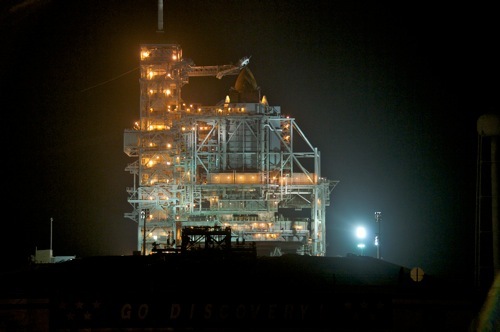 From the press viewing area, you can barely see the Launch Pad 39A where Discovery sits awaiting liftoff. There is however, good news, the weather is supposed to clear tomorrow. There will be some winds, up to 20 knots, but that's within the acceptable range for launch. At this time, they're predicting a 20% change that weather will interfere with the launch tomorrow. If the launch is delayed until Friday, there is a 30% chance it will interfere, and up to 40% if they delay until Saturday. 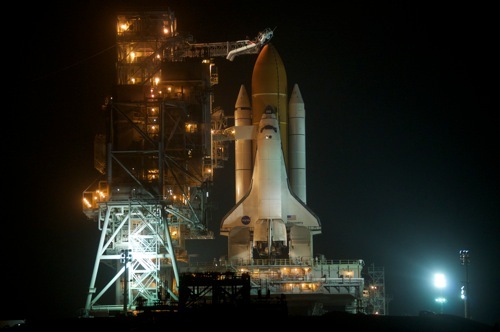 Tonight at 8pm ET, the RSS, or Rotating Support Structure, will move away from shuttle Discovery. 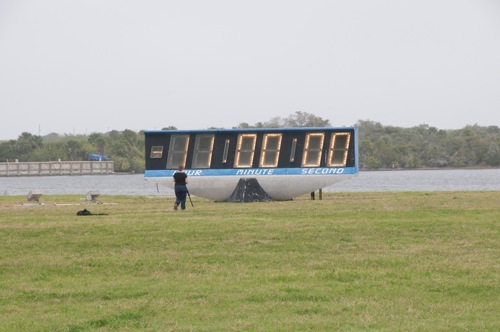 The countdown clock is holding at 11:00:00. 7:25 AM - Tanking begins. 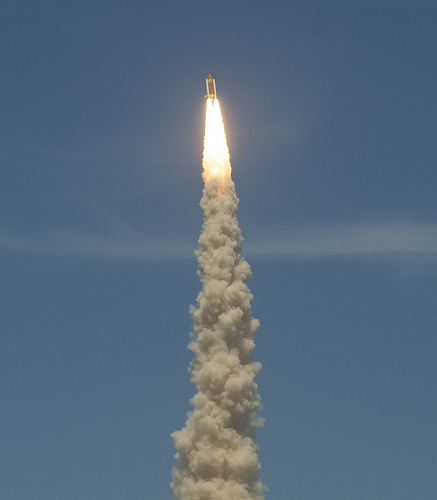 Discovery is loaded with fuel. 12:30 PM - The Astronauts get into their flight suits, and prepare to depart to the launch pad. 1:00 PM - The crew get into the Astrovan and head to the launch pad. 1:35 PM - Arrive at the White Room, and begin to board Discovery. 4:54 PM - At this point, Discovery will be past the point of return to KSC for an emergency landing. 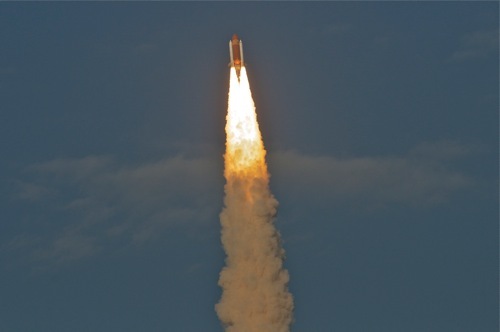 At this point Discovery will be going over 5000 miles per hour! 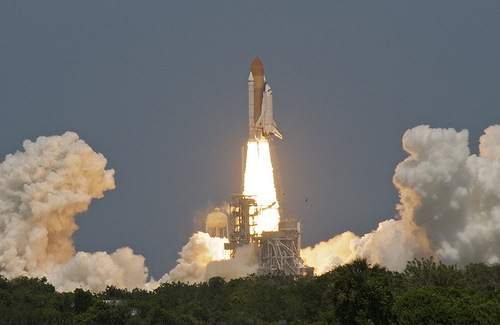 4:58 PM - Main Engine Cutoff, shortly after this time, Discovery will be traveling over 17,600 miles per hour. 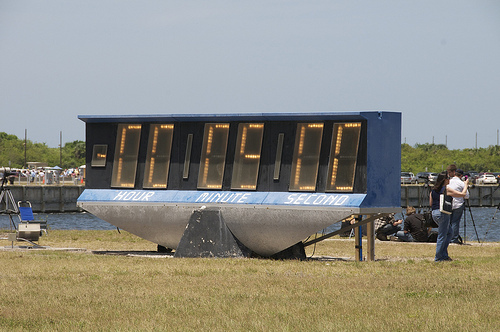 We are here in Titusville, Florida, adjacent to the Kennedy Space Center. 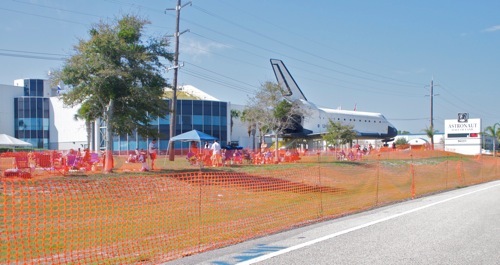 We expect to be on-site at KSC on Wednesday by Noon eastern time. 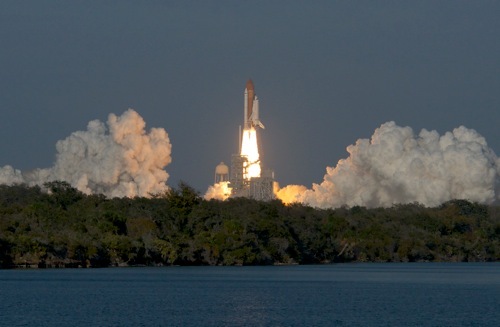 SomaFM will be covering the launch of STS-133 beginning Wednesday, Feb 23rd. The launch is scheduled for 4:50pm Eastern Time (1:50 Pacific) on Thursday. 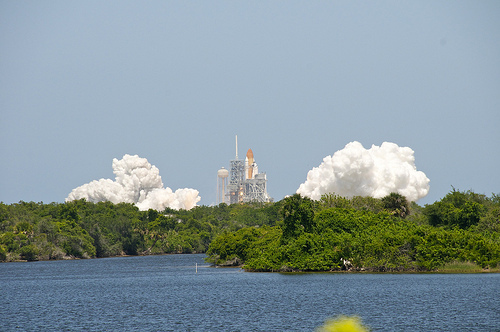 Please check back here for updates from Kennedy Space Center and SomaFM's unique perspective on the launch of the Space Shuttle. 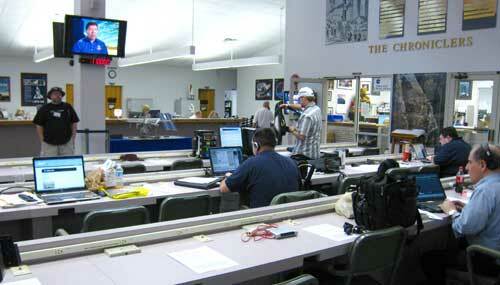 Special thanks to the Kennedy Space Center News Center for their assistance with this production. 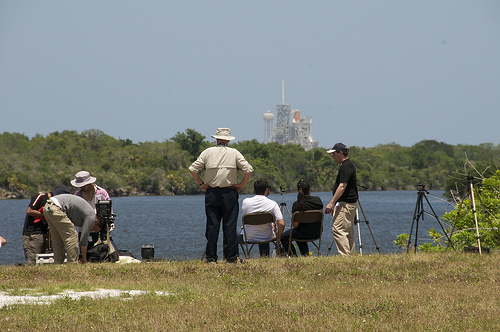 SomaFM was on hand to cover the launch of STS-132 on May 14th 2010.